The news was widely anticipated and now it’s official. Forest industry giant Canfor Corporation has permanently closed its Rustad sawmill in Prince George, British Columbia. The sawmill’s 146 employees had been on tenterhooks about their future for nearly two-and-a-half years. Now, along with closure, they will receive 10 days pay for each year of service and 12 weeks pay in lieu of notice. At the same time the Rustad decision was announced, Canfor also lowered the boom on its Tackama plywood plant in Fort Nelson, B.C. where 199 people lost their jobs in 2008. The Rustad verdict came on the heels of Sinclar Group Forest Products Ltd’s conclusion to close its Winton Global sawmill in Prince George, again for market driven reasons and prohibitive mill re-tooling costs. Earlier in the economic downturn, Canfor’s Clear Lake finger joint plant was terminated. Rustad, Winton Global and Clear Lake represent a legacy of Prince George’s recessionary casualties. Forest industry-strong communities across Canada can, alas, quote their own lists. The Prince George trio of mills had proven resilient. Until now. The Rustad family, for example, has been part of the Prince George sawmilling heritage since about 1947. That was two years before the Canadian Lumberman Magazine launched this gem: “A sawmill is a poorly arranged collection of inadequate and obsolete machinery used to convert logs into sawdust and slabs. It is constantly submerged in a series of cataclysmic disasters of fluctuating intensity, some of which have disturbed seismographs as far east as Woodsocket.” And that was just the beginning. The Rustads’ ventures, however, turned out very differently. The family originally ran a general store in Rose Valley, Saskatchewan during the Depression. The story is they took in lumber as trade from cash-strapped farmers and, well, one thing just led to another. The Rustad brothers prospered in Prince George. They built a new mill in 1965, added a planer a couple of years later and doubled the sawmill’s capacity in 1973. The Pas Lumber Co Ltd.—as the Winton Global sawmill was known for decades—began in Prince George in 1954. But The Pas’ lumber roots through its previous owners, the Winton family, go back to Prince Albert, Saskatchewan circa 1905. The Winton’s also operated a sawmill in The Pas, Manitoba and across the border in Reserve, Saskatchewan. In B.C. the family also operated a sawmill in Bear Lake, north of Prince George, expanding it at least twice before its demise following this latest collision of calamities. Sawmills have always been volatile enterprises in the B.C. Interior. In his 1966 annual report to the Northern Interior Lumber Association based in Prince George, association president Hans Roine, a successful lumberman and entrepreneur, encapsulated much in this observation. “Ten years ago, this area supported 1,200 operating sawmills with a total production of 380 million board feet. Today there are 400 sawmills producing 1.25 billion board feet.” Poke around in the bush today or by a lake shore and the tell-tale clearings of old sawmill sites remain visible. Elsewhere, decaying sawdust piles are the old mills’ gravestones. Roine probably wouldn’t be too surprised, in general terms, at what defines today’s sawmilling industry structure. Aggressive acquisitions and intense consolidation were not exactly unknown in his heyday. Growth has become a blood sport among shareholders of ever-expanding forest companies: the desire to be the last man standing is the ultimate reward of the game. Fortunately, it hasn’t worked out that way. Not yet, at least. West Fraser and Canfor are the region’s (and Canada’s) big two with Tolko in third spot. But, in the best of sawmilling traditions, there are exceptions to the rules, the trends and the expert predictions du jour. 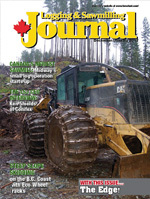 For example, Conifex Inc., entered the Prince George region sawmill company fraternity when the recession was forcing most to bunker down (see an interview with Conifex CEO Ken Shields on page 24 of this issue). Backed by savvy owners with cash, local knowledge and a solid business plan, Conifex has done rather well in short order. The company has two sawmills in Mackenzie and another in Fort St. James (that other companies had been forced to abandon) with a combined annual lumber producing capacity approaching 745 million board feet. The Prince George area also has two other independent sawmill forest companies which together are in to their second century of making lumber. The Novak family bought Dunkley Lumber Ltd. in 1977. The company was founded in 1951 by the Dunkley family at Strathnaver, about 80 kilometres south of Prince George. Dunkley is a pioneer of selling quality lumber into the Japanese market, along with its other customers, and has a reputation around the industry as operators of a “sawmiller’s sawmill”. Prince George has also been home to the Carrier Lumber Company since 1951. The Kordyban family arrived from Alberta and continue at Carrier’ helm.